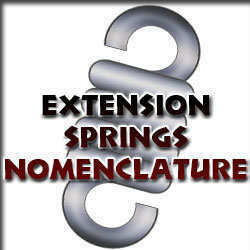 Wire spring nomenclature is basically the terminology used for each spring type in the coil spring industry. 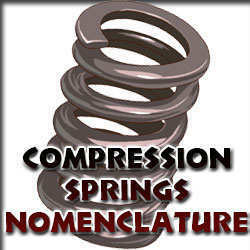 Find compression spring nomenclature, extension spring nomenclature, torsional spring nomenclature, and more. Compression springs are helically coiled round wires shaped with pitch in between each coil. They are used to store energy when compressed and to release that energy when a load is released. Extension springs are tightly coiled round wires keeping the coils compressed together in its free, unloaded state due to an amount of initial tension gathered between its coils. 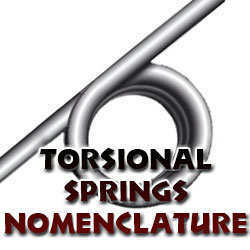 Torsion springs are tightly coiled round wires with straight wires coming off the ends which make the legs of the torsional spring. 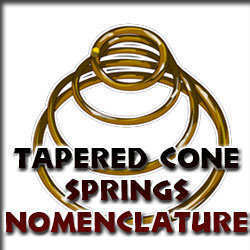 Conical springs are compression springs which are helically coiled round wires forming a tapered of conical shape. They are used to provide balance and reduce the solid height. 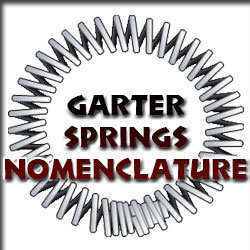 Garter springs are long length extension springs with ends which are modified in different manners in order to make them connect and form a garter belt. 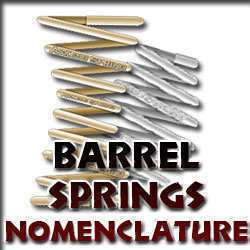 Barrel springs are compression springs which are helically coiled round wires forming a convex or concave shape. They are used to provide balance and reduce the solid height.